This section includes a list of Howden inhabitants in 1914. You can also trace your ancestors in the 1841 Howden census, find out about Howden Market Place in the 19th century, explore the history of Howden's shops, inns and tradespeople, read reminiscensces about life in Howden in the first half of the 20th century and view old photos of Howden and surrounding Howdenshire villages. Please do also have a look at Ken Deacon's excellent website for even more information and books about Howden's airships. I also provide a professional genealogy research service for Yorkshire and the whole UK, as well as a large collection of Howden old photographs. I regularly undertake local archive research and can search records relating to Howden and elsewhere in Yorkshire on request. Please contact me to inquire further. The area where Howden and other villages such as Eastrington and Knedlington now stand was once part of a large inlet from the Humber. Howden, Eastrington, Knedlington and perhaps Hive were probably on the bank or shore, while the sites of other later settlements were at least intermittently waterlogged. Later, the water receded and left streams and rivers and small raised pieces of land. There was little settlement before the Anglo-Saxons locally, but there were Iron Age settlements across the River Foulness (Foona) at Hasholme and Roman settlements at Brough, Brantingham and Faxfleet. Howden has been greatly influenced by the River Derwent. The Anglo-Saxons first settled on the site because there was a raised area of land in the 'halh' or nook of land in the curve of the river. There is today the street name of Hailgate (Halh street) to remind us of this as it curves alongside the old Derwent running through the town. The first documentary mention of Howden occurs in the work of Geraldus Cambrensis and tells the story of Osana, who was born circa AD 698 and died circa AD 750 at Howden. She was possibly the daughter of King Aldfrith of Northumbria and St. Cuthburga, and is said to have been the sister of Osred, King of Northumbria. Her sanctity was first manifested, long after her death, by a 'miraculous flagellation'. She was buried in the church of Howden but no special veneration was paid her until, one day, the concubine of the rector went into the church and sat down on her tomb. She later found that she could not rise from her seat. She struggled and called her friends and they pulled her, but she could not be moved from the stone. The concubine realised that a punishment had fallen on her and that she was called to repentance. She resolved to amend her life and separate from the priest with whom she lived; and when she had made a vow to do so, she was able to leave her seat, but not before her dress was torn and her skin marked with many strokes of discipline. This tale suggests that Howden had a considerable church by the eighth century. The earliest written records of several of the villages around Howden occur in a charter of 959 AD. These are Knedlington, Barnhill, Caville, Thorpe, Hive, Eastrington, Belby and Kilpin. Barmby on the Marsh in 1050. Ousethorpe, Portington, Burland, Asselby, Cotness, Laxton, Saltmarshe, Skelton, Yokefleet are all mentioned in the Domesday Book of 1086. Blacktoft is mentioned in the 1150s, Balkholme in 1199, Greenoak in 1202, Bellasize in 1212, Wallingfen in 1228, Scalby in 1230, Bennetland in 1234, Gilberdyke in 1234, East and West Linton in 1246, Metham in 1268 and Sandholme 1285. By the time of the Domesday book of 1086, Howden and Howdenshire, previously a royal manor, had become a manor of the Bishop of Durham. The bishops gave Howden a fine palace, visited by kings and politicians, and instituted a grammar school whilst the canons built the magnificent church and King John granted the right to hold a market and fairs. Howden was a thriving town in medieval times, but suffered in the sixteenth century when the Reformation brought the withdrawal of church wealth. 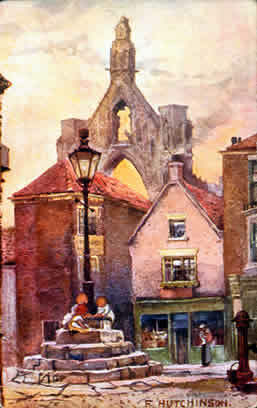 Parts of the church later collapsed and Howden became a typical East Yorkshire market town and the annual fair brought welcome visits from London merchants, although these declined in the seventeenth century. Howden was not greatly affected by the civil war although local families - the Arlushes of Knedlington, Moncktons of Caville and the Methams from near Laxton - all fought for the Royalists. Howden grew in the eighteenth centruy and several professional men and tradesmen built large houses in the town, which still provide it with much of its character. The annual fair became a specialist horse fair where, every September, buyers came from all over Europe to buy horses for their armies. The nineteenth century began well for Howden, with the Wells family at nearby Booth ferry developing the river crossing and making it a popular route for stagecoaches. Howden had over 20 inns and almost every trade was represented in the town. But the growth of Goole took business from Howden, and its population fell. The Hull and Selby railway, opened in 1840, passed Howden a mile to the north although the Hull and Barnsley railway later built their line closer to the town. Howden was briefly rejuvenated when the airship R100, designed by Sir Barnes Wallis, was built just to the north of the town, near Spaldington. For five years there was plenty of work, but after the airship flew to Cardington in 1929 the airship station was closed. In the same year Boothferry bridge was opened, making it even easier to travel to Goole, and the Howden church tower was set on fire, although the severe damage caused was able to be repaired. Howden was known in the nineteenth and twentieth centuries as a centre for market gardening and grapes and later tomatoes were produced in large quantities. Many Howden men and women lost their lives in the two world wars but Howden itself was not bombed. It was, however, surrounded by bomber stations and there was a Land Army hostel in the town. Dances in the Shire hall were very popular. In part due to its proximity to the M62 motorway, Howden in recent times has become a highly desirable place to live and work and its population is once again rising.